Last night I observed two passes of the HTV-4 (Kounotori-4), just before it was grappled successfully today with the Canadarm-2 for berthing to the International Space Station. I observed a lower pass – earlier in the evening – with binoculars and it showed the typical reddish color I witnessed more then once in an HTV vehicle. I dare say that the HTV is one of the most deeply red satellites we can observe in the night sky. What I also witnessed were some nice flares off the HTV body; these have been reported by more observers since the HTV-4 launched. One additional note is that the HTV turned more white when it turned to the East. This could be relatively easily explained by the structure and the layers of the colored foil and how it is wrapped around the HTV. I caught the second pass of the HTV-4 with the telescope, just in a short break in the clouds. 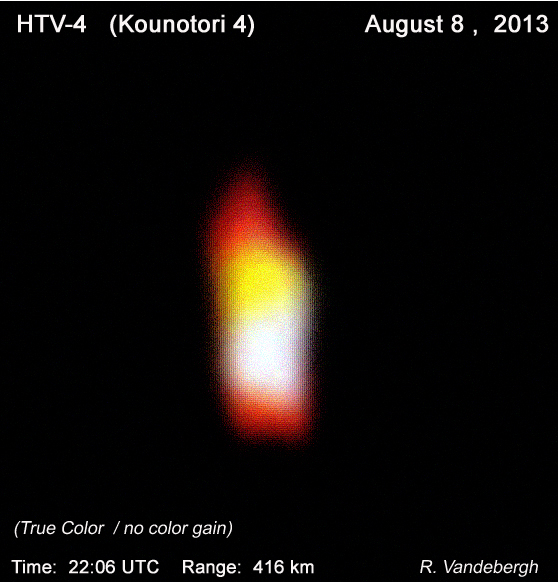 I succeeded to capture one big HTV-flare as seen in the animation. We can see the elongated shape of the HTV and the reddish color which is the real color with no increased color saturation. This demonstrates once again that the HTV is one of the most colored satellites we can observe!